Electric arcs have been used to join metals for over 100 years. The most widely used technique of arc welding is the process where an electric arc, carrying a current, usually between 100 and 600 amperes, is struck between the metallic objects to be joined and a metallic electrode rod (or wire) which is consumed in the process. The metal of the electrode is melted by the intense heat of the arc and transferred under the influence of a strong electromagnetic field to a pool of molten metal, which makes the join. It had been recognised that pulsed currents could dramatically improve the control of the molten drop transfer and hence the weld quality. However, this offered significant practical challenges. To tackle this problem a collaboration was established between CSIRO and Welding Industries of Australia (WIA) and, after a few years, a joint team of researchers and industry led by Graeme Ogilvie developed a commercially successful pulse welding system called the Synchro-Pulse Controlled Drop Transfer or Synchro-Pulse-CDT system. 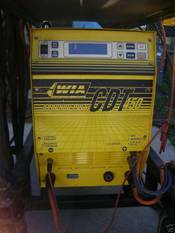 This machine has had a significant influence on welding techniques worldwide. In recognition of his contributions to the development of the Synchro-Pulse-CDT system Graeme Ogilvie was awarded one of the three inaugural CSIRO Medals for Research Achievement in 1985. In the mid-1970s the British Welding Research Institute concluded that the use of pulsed currents in the welding arc offered a chance for developing new electric arc welding technologies. In 1978 Dr Graeme Ogilvie at the CSIRO Division of Tribophysics studied the literature and conducted exploratory experiments to confirm this claim. In 1979 Graeme Ogilvie’s group, developed a pulsed current generator using thyristors to switch currents of several hundred amperes at repetition rates of up to 5 KHz. The generator performed well under test and was described in a presentation to the annual conference of the Australian Welding Institute in September 1979. Mr AH Langdon, then Managing Director, of Welding Industries of Australia (WIA) was present at the conference and was aware of the possible commercial impact of pulsed arc welding as one of his employees Mr WK Brougham had developed a low powered pulsed arc machine of limited operational flexibility to market place readiness. Soon after the formation of the CSIRO Division of Manufacturing Technology in 1980, Mr Langdon sought a collaborative agreement with CSIRO to develop a commercial pulsed arc welding system. By 1982 the British Welding Research Institute had developed a machine for pulse welding, but the basic design of its electrical system for controlling the pulse was inherently unsatisfactory and it was never commercially successful. A close-knit team incorporating scientists, research engineers and industrial practitioners was formed. The team consisted of scientists from the CSIRO Division of Manufacturing Technology, a senior welding expert seconded from WIA, and engineers from WIA’s Equipment and Research Development Division. There task was to marry the CSIRO technology into a commercial product of worldwide significance. However it was found that great demands were placed on the motor skills of the operator. The distance between the welding gun and the workpiece needed to be kept constant within small limits to overcome the disproportionate effect caused by operator handshake or a change in the contour of the workpiece surface. It was therefore necessary to develop a method of sensing the distance between the workpiece and the welding gun by measuring the instantaneous arc voltages and currents and then using this information in a feedback loop to control the process to provide one drop of metal transfer for each pulse; achieving this feedback greatly reduced the motor skills required by the operator. A key factor in the success of the Synchro-Pulse CDT was the design and development of a simple and rugged pulse generator, which met the severe demands of high productivity and high performance arc welding. the design of the pulse welder needed competent advice on operator psychology, manufacturing constraints, market data and input from sales people. The Synchro-Pulse CDT was formally launched in the marketplace in September 1983 and was stringently evaluated by competing welding equipment manufacturers and by operators in the steel fabrication industry. In the years after the formal market launch the design of every sub-system was revised. Close attention was given to providing the operators of the equipment with clear displays of operational choices and operational data. In addition the arc sensing system was markedly improved. The Synchro-Pulse CDT became successful in the International marketplace becoming dominant in applications where welds had to be of the highest quality. In particular the welder is widely used in shipbuilding particularly for welding aluminium and stainless steel. A widely known application of the welder was its use in the manufacture of Australia II the successful yacht which won the America’s Cup for Australia in 1983. Another prominent example of the application of the Synchro-Pulse CDT was its use in the fabrication of the flagpole at Parliament House, Canberra. A striking endorsement of the commercial success of the welder was a comment by the Managing Director of WIA. He stated very clearly that the return to overall profitability of his company resulted from the development of the Synchro-Pulse. For his role in leading the development of Synchro-Pulse CDT, Graeme Ogilvie was awarded one of the three inaugural CSIRO Medals for Research Achievement in 1985. Graeme Ogilvie was elected a Fellow of the Australian Academy of Technological Sciences and Engineering in 1992.